​Please Join us for an exciting evening of dining and dancing, while supporting a great cause. Ticket includes dinner and entertainment. There will be contests, auctions and lots of fun. All proceeds directly benefit McHenry County Adult Program (McCAP). ​RSVP to reserve your seat... Check back for more info. Come out and have a hamburger... and support McCap at the same time!... 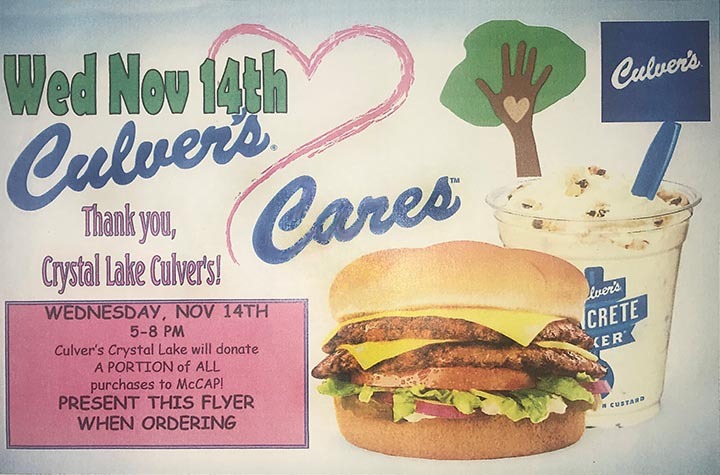 Culver's of Crystal Lake is having a "Culver's Cares" night and will donate a portion of all purchases to McCap! ​McCAP’s 2nd Annual “Ale Yes!” Brewfest. McCAP is “brewing” up a fun afternoon! 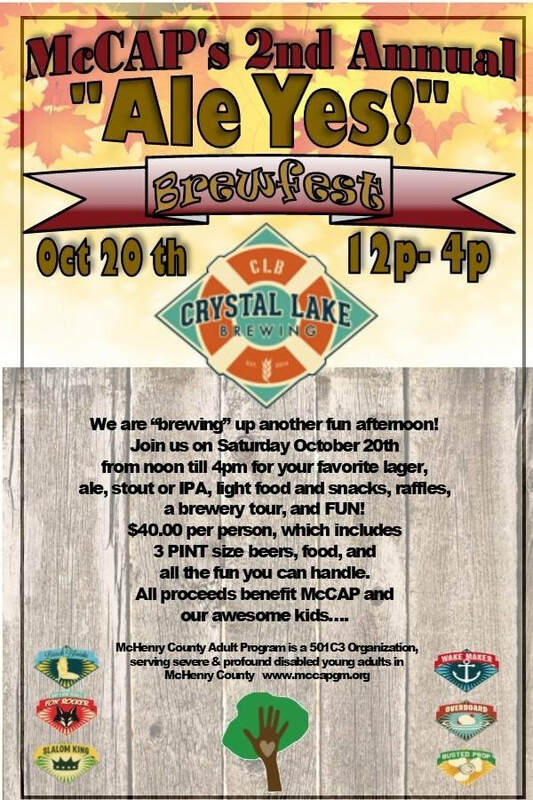 Please join us for your favorite lager, ale, stout or IPA, from Crystal Lake Brewing. We will have light food and snacks, a brewery tour, raffles and FUN. $40 per person, which includes (3) pint sized beers, food and all the fun you can handle on a Saturday afternoon. All proceeds benefit the non-profit 501C3 program, which serves severe and profound disabled young adults in McHenry County. ​Please Join us for an exciting evening of dining and dancing to the live music of Chicago's very own Not For Profit Band, while supporting a great cause. Ticket includes dinner and entertainment. There will be contests, auctions & a fully stocked cash bar. All proceeds directly benefit McHenry County Adult Program (McCAP). ​RSVP to reserve your seat... Tickets will not be sold at the door. ​McCAP’s 1st Annual “Ale Yes!” Brewfest. McCAP is “brewing” up a new event! Please join us for your favorite lager, ale, stout or IPA, or their newest “beer-wine” from Crystal Lake Brewing. We will have light food and snacks, a brewery tour, raffles and FUN. $40 per person, which includes (3) pint sized beers, or (2) beer-wines, food and all the fun you can handle on a Saturday afternoon. All proceeds benefit the non-profit 501C3 program, which serves severe and profound disabled young adults in McHenry County.